Allington is an almost entirely modern village situated alongside the sides of the A20 road west of Maidstone in Kent. It is part of the built-up area of Maidstone. It has two primary schools; Allington Primary and Palace Wood. The Mid Kent Shopping Centre is located in the middle of Allington. 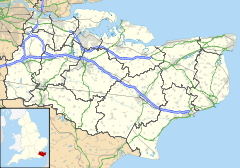 The name Allington, which is shared by a hamlet near Lenham, is derived from the Old English tun farmstead; it comes via eleventh-century Elentun and was connected with a man called Ælla. Allington Castle was originally built in the 11th century. In 1281 the present stone castle was built, which was converted to a mansion in the 15th century. In 1492 the castle came into the possession of the Wyatt family. By the mid-19th century it was derelict, but was restored in 1905; in 1951 it was taken over by the Carmelite order. Today it is owned by Sir Robert Worcester as a private residence and is not open to the public. The few dwellings around the castle had a population of 49 in 1841. There was a church dedicated to St Laurence which closed in 1969. In the modern village is a modern parish church dedicated to St Nicholas, the second to be built on the site. Furnishings from St Laurence's are used here. Down the hill from St Laurence's Church is the River Medway, Allington Lock and Allington Sluice. There is a footpath over the lock. Below the lock, the Medway becomes tidal. On the other bank is the Malta Inn, and Kent Life. A footpath runs from here to Teston. A Park and Sail service (claimed to be the only one in England) operates on the weekends leading up to Christmas. Using the car park and boarding by the Malta Inn, the MV Kentish Lady carries shoppers to Maidstone and back. The nearby 20/20 industrial park, named after the adjacent M20/A20 junction, includes Allington Quarry Waste Management Facility. ^ "Maidstone Ward population 2011". Neighbourhood Statistics. Office for National Statistics. Retrieved 14 September 2016. This page was last edited on 20 July 2018, at 15:18 (UTC).